HARNESS THE POWER OF DRIVER AWARENESS WITH REAL-TIME DATA FOR SAFER, SMARTER STREETS. Your SafePace signs seem to be slowing cars down, your police department can reallocate resources, and residents seem pleased with reduced speeding. But what are your signs really doing? We know you want to see what makes your signs tick; to control what, when, and how they display text and graphics; and to monitor and analyze speed data. All SafePace signs include the SafePace Pro software package with its clean, user-friendly interface that allows you to control sign parameters and performance. Optional data collection gives you invaluable insight into traffic trends and sign performance data. Our signs are all Cloud enabled and with your subscription to the SafePace Cloud, you can access all traffic data, as well as manage sign parameters from all your signs at once, with remote access from anywhere. With this affordable web-based subscription you can access all your traffic data and manage sign performance from anywhere with an internet connection. No need to connect to signs or visit sign locations- real-time data is accessible whenever and wherever you need it. Our intuitive, easy-to-use software program makes managing your sign a breeze. View sign data by location, schedule sign performance based on times of day/week, or adjust digit flashing frequency. This software is included with every sign purchase. Leverage the data gathered by your signs for more informed decision making and safer streets. Access a wide variety of reports illustrating sign performance, statistical data, and traffic trends. 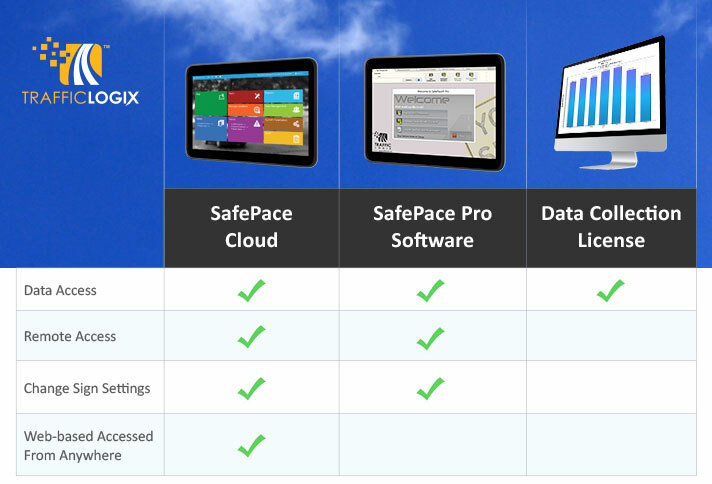 Data can be downloaded from sign locations or accessed remotely with the SafePace cloud.